Live & Dynamic Flight Information Display Systems – showing arrivals, departures, airlines, flight numbers, cities, flight status, times and gates. 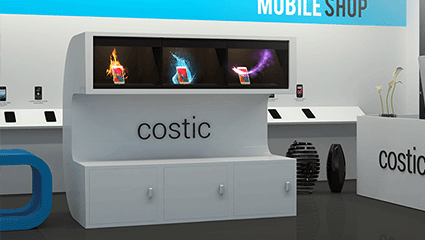 Innovative digital solutions to create attractive showroom aesthetics, brand promotion kiosks, customized car configurator applications to boost customer engagement. Enhance patron service through self-servicing kiosks, better queue management system for retail banks, and digital promotion to upsell / cross-sell schemes. Personalised information boards to enable corporate communicates with employees and better organisation management, meeting room signage, wayfinders in large spread corporate campus. Digital screens and interactive kiosks at strategic locations on campus deliver real-time communication to students, faculty and staff. Add excitement to visitor experience through architectural videowalls & centre pieces, interactive kiosks, digital promotional banners at theme parks, movie theatres and other entertainment businesses. Enable co-ordinated healthcare through right-in information at all essential locations. Centrally managed customized digital menu boards for an independent eat-out or chain of restaurants. 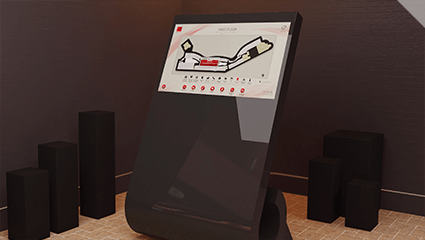 Enabling new shopping patterns through interactive kiosks, in-store promotional & advertising digital banners, shelf signage solution, POS displays, etc. Digital screens on buses & trains to provide updated information on route, timings and services offered. Also, generate additional revenue through 3rd party advertisements and spread public service information. Personalised information boards to enable corporate communication with employees. Better organisational management through meeting room signage, wayfinders in large spread corporate campuses. Holobox advertising display technology delivers floating mid-air 3D images that engage and inform customers at point-of-sale or any in-store advertising locations in a dramatic manner!!! NUSYN’s way finding solution provides easy accessible location details and delivers efficient direction guiding system to any large facilities or teeming environment. 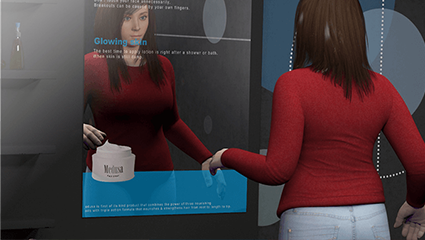 Create a convincing “life-size” interactive display from a tricky combination of augmented reality and motion-controlled interactivity. NUSYN’s way finding solution provides easy accessible location details and delivers efficient direction guiding system to any large facilities or any teeming environment. NUSYN’s Fling is a must for retailers for assisted-selling! It lets users throw content from a tablet to a screen, then swipe it right back with a reverse gesture. 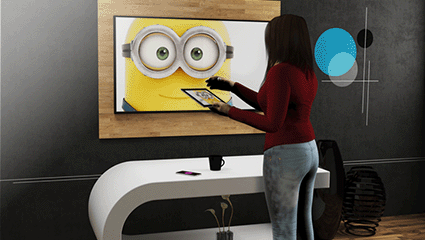 For interactive & unified digital signage solutions.